I’m sure there is a pattern out there for pants like these somewhere, but I couldn’t find one for the life of me. There were a few criteria I wanted to meet: hipster rise, side pockets, big front pleats, real fly front, semi-fitted and tapered legs, and back welt pockets. I skipped the back welt pockets on mine because this was just a test run. I also planned to crop them to the length you see in the photos, but I cut them too long and I quite liked the rolled up look instead. These pants are a very wearable muslin in inexpensive cotton sateen. I just wanted a pair of pants that would fit me so I used my trusty TNT crotch curve and drafted around that. The fit is quite good, but there’s something a little funny going on in the front. I suspect it’s because I spent so long stuffing around with the front fly and my zipper extends too low into the crotch curve. It could also be something to do with the pleats. Shortening the zipper should at least partially solve this for next time. I also need to widen the pocket bags and shorten the pockets quite a bit. They are impractically narrow and too deep at the sides. I really like the rise though, and the waistband width. With hipster pants, you need a curved waistband rather than a straight one. I’ve always had the problem of significant back gaping in the waistband of RTW hipster pants/jeans and I think this comes from the waistband being straight, or too straight for my figure. It was a nice feeling to get a good fit in this spot. This entry was posted in cotton, pants, self-drafted, Uncategorized and tagged black, cotton, pants, pleats, sateen, trousers, wool on September 25, 2015 by Debbie Iles. These are so great Debbie! Can I ask how your drafted the original crotch curve, is there a particular method you used? Thank you Jessie! I’d love to know the answer to that myself! 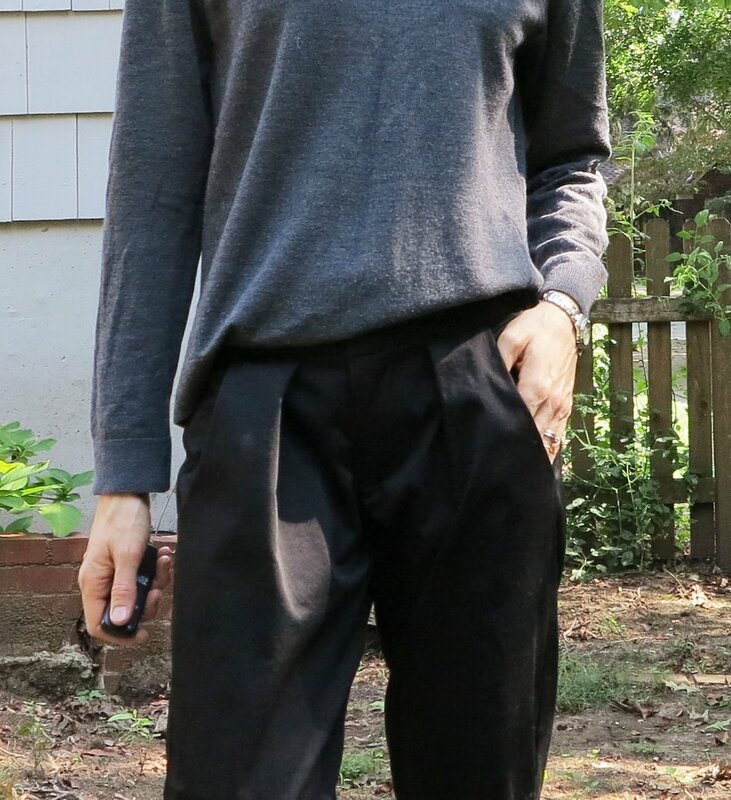 I’ve just tweaked many pants patterns over the last two years to a fit that I really like on me. I just tried to keep that curve as I drafted the rest of the pants. From here these pants look awesome. The fit is a dream, roomy enough to be able to move around, cool enough to be, well, cool.